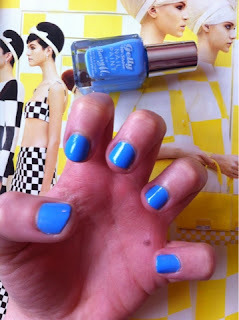 Barry M Gelly Nail Paint! I bought a lovely new shade of nail polish this week as it was feeling rather Spring-like and the new Barry M Gelly nail paints come in lovely pastel shades. This one is Blueberry and applied really easily. I'm one of those girls that, despite how carefully I try, will always end up with messy right hand nails because I CANNOT use my left hand to save my life. However, this polish applied really easily and I didn't even make any mistakes. I will definitely be purchasing the Gelly nail paint in other shades. 10/10!